Engaged employees — especially those on the frontline, i.e. the public face — are a company’s best asset. Without consistent nurturing and attention, turnover rates increase and productivity often declines. However, companies who have learned how to embrace these internal brand ambassadors and elevate them to rock star status share a few common characteristics, including more successful business outcomes. The tide has turned. Companies have begun to shed the top-down approach to innovation, where management develops programs and initiatives that it feeds down the hierarchical chain. Often, as McKinsey & Company notes, “a hurdle in offering a superior customer experience is translating boardroom vision into frontline action.” To truly create new work habits and have programs make a lasting impact within and throughout the entire organization, traditional silos must be broken down and collaboration across the company must be fostered. 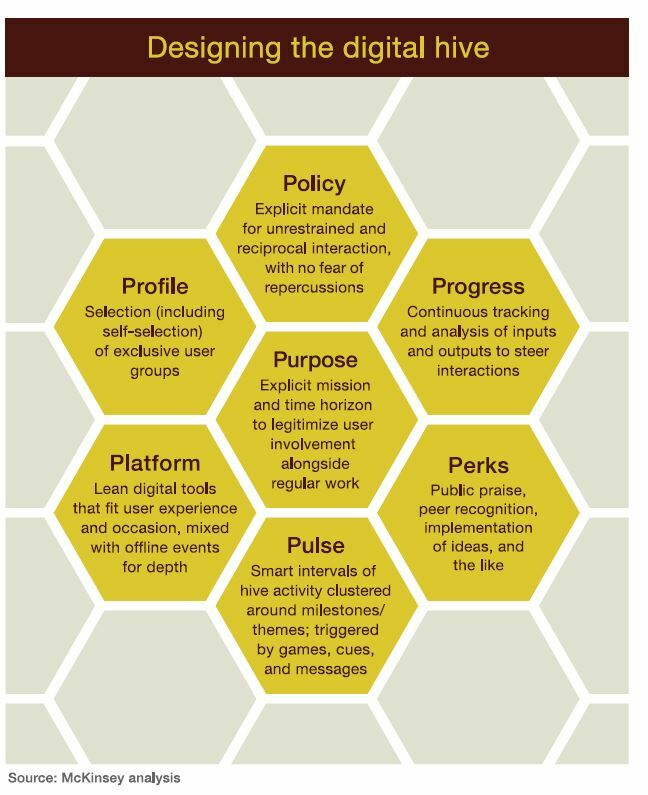 McKinsey recommends setting up digital “hives” – hubs for collective activity to solve particular problems and institute organizational change. To connect disparate silos, companies can turn to a digital platform that links all employees and groups who are working toward a common goal, such as fulfilling a customer order. These “social chains” enable employees working in different steps of the customer service process to connect in real time and share how they work together, tackle a problem and identify speedbumps in the road, hence creating more efficiencies. Collaboration and cohesiveness don’t happen overnight or in a vacuum. Companies need to offer training on how to think creatively about innovation, offer more opportunities to role model and compare actual behavior to the ideal. If management is willing to let go of old habits and processes, and comes across as genuine and appreciative of everyone’s perspective and contributions, employees will embrace change more enthusiastically. Good managers still play an important role. But rather than dictating new programs or customer service approaches, they guide the ship by engaging staff and recognizing their successes/contributions. This process affords employees at every level with a means to provide direct input into their job and the success of the company. 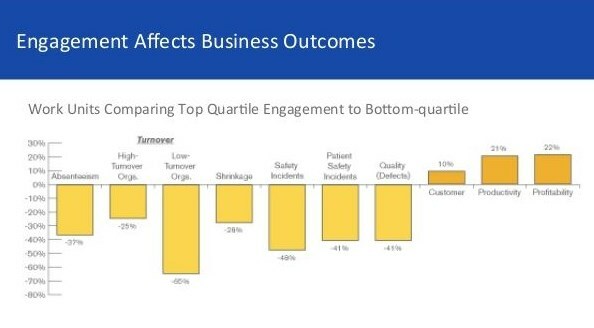 Organizations with a high level of engagement outperform those with lower engagement by 10% on customer ratings, 22% in profitability, and 21% in productivity, according to a meta-analysis of 1.4 million employees conducted by the Gallup Organization [insert link]. Engagement helps to reduce the industry average turnover rate of 15.7%. Dale Carnegie reports recruiting costs run approximately 1.5 times annual salary, so engaging and retaining valuable employees has a significant impact on an organization’s bottom line. While some companies balk at allowing employees to engage on social media during working hours, there are data that speak otherwise. Happy employees are more likely to speak positively about the company, especially within their network of family and friends. A sincere, positive endorsement from someone who works within the organization goes a long way to fostering new and loyal customers alike. According to a recent study conducted by the MSLGROUP, brand social media posts shared by employees reach 561% further than the same posts shared by company pages. Empowering employees to become brand ambassadors actively on social media can reap big rewards. Nokia offers a great example of a company which encourages its employees to engage in social media to promote the brand. The company has guidelines for social media use but every employee can speak freely online. This makes every employee a true Nokia brand ambassador who can respond to both positive and negative comments and feedback wherever they encounter it. So how does Nokia keep its employees connected and excited about its product offerings? As suggested above, it uses a digital hub called Socialcast to keep everyone updated. Employees are encouraged to share their personal stories and work news within the appropriate Socialcast groups, and then to share their stories and company news online. Nokia finds this builds community and engagement among employees all over the world, and creates company buzz with the public. Regardless of business silo or focus, employees are the most valuable asset to any company. Those companies who recognize the goldmine that lies within are the ones that will continue to excel, innovate and succeed.